Treadmill, exercise bike, leg press, chest press, elliptical machine, calf machine, leg adduction/abduction machine, pec deck machine … The choice is endless. 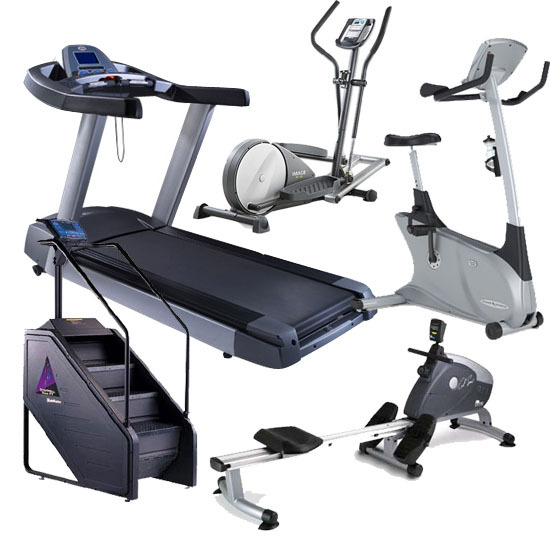 These are some of the machines which may be found at any modern gymnasium. Most people, in order to get some exercise, like to head off to the gym nowadays. Apart from performing your workout, it’s a good way to meet other people, socialise and enjoy yourself in the company of others. Exercise machines are very important in helping people maintain optimum physical fitness and health. They, especially modern machines utilising advanced technology are easy to learn, understand and use. With machines, it’s easier to target the exercise at a specific area of the body such as a specific muscle, which would be more beneficial for the person training as it could build bigger muscles, and it’s safer too. Machines may be ideal for someone with a very low level of fitness or is recovering from an injury, as they will help get their strength up quickly and safely. Since machines isolate the muscles, it may also be easier to work around certain injuries. Also the risk of dropping a weight on the foot or head would be reduced. They also keep the body, ex. the spine, stable during the exercise ritual. Another important factor is that machines allow you to exercise on your own. On the negative side, too much stability provided by the machine may rob the body of being pushed to the maximum as the machine has already done part of the work for you. The movements provided by exercise machines are known to be one-dimensional while real world movements are three-dimensional. The movements as well as the training on machines are forced which means you are prevented from moving the way your body was designed to, due to the machine restricting your movement to a specific path. Another minus factor is that machines don’t require as much energy expenditure as other forms of exercise since you’re moving less mass. Also, to exercise on machines, you have to gain gym membership and regularly visit the gym too (unless you are prepared to make a heavy investment on one for your home). This may prove to be inconvenient due to work and other commitments, and also depending on the size of the crowd at the gym, you might have to wait until the machines of your choice are free. Also important to know is that inappropriate use of exercise equipment can lead to injuries which may range from mild to extreme, sometimes even leading to lifelong disabilities. Torn ligaments, sprained and strained muscles and overly tired joints and limbs may be just a few of the cons of exercising on machines without proper attention and guidance. You’ll make better choices, reduce your risk of injury, and improve your overall outcome when you know more about the plus and minus points about exercise machines. That is why it’s more beneficial to get the services of professional personal trainers in your quest for the highest levels of health and fitness. Personal trainers can advise you on which machines you should use and which machines to avoid, the level of intensity at which you should do your exercises and how often you should do it and give you proper assistance and guidelines. Be Fit, the fitness company belonging to Be Unique Group, is known for the best personal trainers in Dubai. Their professionalism and experience have given them the edge over everybody else when it comes to health and fitness in Dubai. The company uses the best, the most advanced exercise machines in Dubai, but do not entirely rely on them. Its personal trainers are perfectly at ease in ‘machineless’ environments too, such as parks, deserts, the beach, gardens or other natural spots. The friendly and dedicated personal trainers of Be Fit will help you achieve all your fitness goals. Be Fit was started as an executive fitness training company, working with individuals and corporates, with the sole purpose of helping successful professionals to look and feel good and live a longer and healthier life. In a short span of time, the company has reached the top spot in the fitness arena in Dubai and has no signs of slowing down, literally. Be Fit is at Sheikh Zayed Road, Oasis Center.